The historic designation of San Antonio’s last Pure Oil gas station at 901 Nogalitos cleared another hurdle when the Zoning Commission approved the designation on Tuesday. First Vice President Patti Zaiontz read our statement of support. Read more about the saga to save this unusual little station with big potential – please note, the Society is no longer trying to help find a buyer for the property at this time. City Council, led by District 5 Councilwoman Shirley Gonzales, paved the way for the designation of the station to move forward in October 2018. 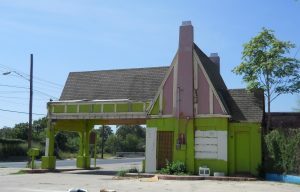 San Antonio’s last Pure Oil gas station, built c. 1934 in the Tudor-revival style.